The ServeRAID M1015 SAS/SATA Controller for System x is an entry-level 6 Gbps SAS 2.0 PCI Express 2.0 RAID controller. The adapter has two internal mini-SAS connectors to drive up to 16 devices and supports the same base RAID 0, 1, and 10 feature set and drivers as the M5000 series controllers. With the attachment of the ServeRAID M1000 Advanced Feature Key, the ServeRAID M1015 offers the option of RAID 5 and SED Encryption Key management, while still being sensitive to administrator cost concerns in an entry-level RAID environment. Note: This adapter is now withdrawn from marketing. The ServeRAID M1015 SAS/SATA Controller for System x is an entry-level 6 Gbps SAS 2.0 PCI Express 2.0 RAID controller. The adapter has two internal mini-SAS connectors to drive up to 16 devices and supports the same base RAID 0, 1, and 10 feature set and drivers as the M5000 series controllers. With the attachment of the ServeRAID M1000 Advanced Feature Key, the ServeRAID M1015 offers the option of RAID 5 and SED Encryption Key management, while still being sensitive to administrator cost concerns in an entry-level RAID environment. 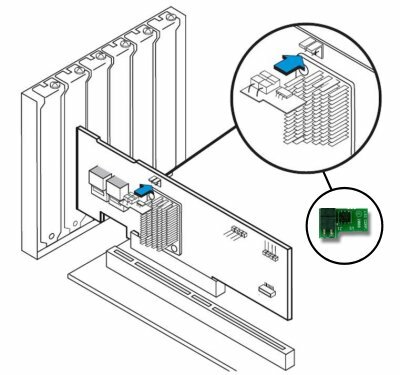 This RAID controller provides connectivity to internal direct-attach or expander-attached hard disk, solid-state, or self-encrypting drives. 6 Gbps SAS 2.0 technology has been introduced to address data off-load bottlenecks in the direct-access storage environment. This new throughput doubles the transfer rate of the previous generation. SAS 2.0 is designed for backward compatibility with 3 Gbps SAS as well as with 3 Gbps SATA hard drives. 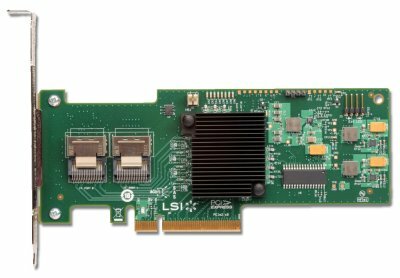 Regardless of the drive speed, 6 Gbps ServeRAID adapters will deliver significant performance improvements in both read and write applications as compared with their 3 Gbps predecessors. Self-encrypting drives are based on a new technology that helps prevent data from being accessed without authorization. These drives adhere to the Trusted Computing Group (TCG) Enterprise Security Subsystem Class specification and are National Security Agency qualified to provide government-grade encryption. With self-encrypting drives, if a drive is removed from its storage system or the server it is housed in, the data on that drive is encrypted and useless to anyone who attempts to access it without the appropriate security authorization. Figure 2 shows the ServeRAID M1000 Series Advanced Feature Key attached to the ServeRAID M1015 controller just above the heat sink. Auto-resume uses non-volatile NVRAM to save rebuild progress during a host reboot or power failure to automatically resume from the last checkpoint. Auto-resume will ensure data integrity is maintained through the process. The card supports a number of features that are able to be implemented without rebooting the server. Applications such as email and web server benefit from avoiding downtime during transition. Online RAID Level Migration (also known as logical drive migration) provides the ability to migrate a virtual disk from any RAID level to any other RAID level without requiring a reboot. System availability and application functionality remain unaffected. Consistency Check verifies that all stripes in a virtual disk with a redundant RAID level are consistent. The consistency check will mirror data when an inconsistent stripe is detected for a RAID 1 and recreating the parity from the peer disks when in the case of a RAID 5. Consistency checks can be scheduled to take place periodically. Management tools provide convenience for configuration of logical volumes plus alerting when errors have occurred or are about to occur. Patrol read is a background sentry service designed to proactively discover and correct media defects (bad sectors) that arise normally as a disk drive ages. The service issues a series of verify commands and if a bad block is discovered, the card's firmware will use RAID algorithms to recreate the missing data and remap the sector to a good sector. The task is interruptible based on controller activity and host operations. The firmware also provides an interface where the patrol read task can be initiated, set up for continuous operation, and terminated from a management application. Patrol read can be activated by manual command or automatically. A hot spare rebuilds data from all virtual disks within the disk group in which it is configured. ServeRAID provides the ability to define a physical disk as a hot spare to replace a failed drive. Hot spares may be configured as either global or dedicated. A global hot spare allows any physical drive to be designated as a hot spare. A dedicated hot spare will allow the user to assign a hot spare drive to a particular array of the same drive type. Instant secure erase permanently removes data when repurposing or decommissioning SEDs. SafeStore local key management provides the necessary management and protection of SEDs using a simple pass phrase, security key identifier, and security key file that can be set and applied to all SEDs assigned to a ServeRAID adapter. This removes the complexity of managing each SED’s unique encryption key and essentially relieves the administrator from most of the daily tasks of securing data. Note: To use the SED services of the ServeRAID M1000 Series Advanced Feature Key, you must use self-encrypting drives as listed in "Supported disk drives" below. One-year limited warranty. When installed on a System x server, these cards assume your system’s base warranty and any warranty upgrade. Batteries are consumables and therefore are not covered under warranty. The ServeRAID M1015 is supported on the System x servers listed in Table 2. * The ServeRAID M1015 also supports the Hot-Swap SAS/SATA 4 Pack HDD Kit option of the x3650 M2, part number 46D2516. See the ServerProven Web site for the latest information about the specific versions and service packs supported: http://www.lenovo.com/us/en/serverproven/. Click System x servers, then Disk controllers to see the support matrix. Click the check mark that is associated with the System x server in question to see the details of the operating system support.